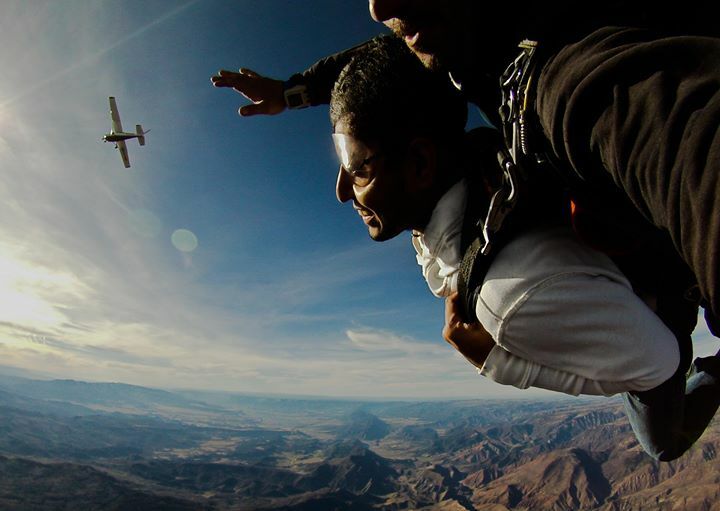 Q: Is there an age limit for a tandem jump? A: You must be 18 years of age to make a Tandem skydive. A: The weight limit is 225 pounds, anything beyond that is at the discretion of the instructor. Q: Can I get video and pictures of my jump? A: You can get both. Check out the prices section for details. Q: What happens if we don’t jump because of weather or winds? A: There are no refunds, we will issue a raincheck or reschedule your jump. Q: Can we send thank you letters? A: Please do! Post all notes of gratitude to our FaceBook page. Q: Do we have to do a tandem before we start training? A: No you do not. However it is recommended. It gives you a full understanding of what you are about to sign up for! Q: Do you do first jump training? A: We do our jump training between March and May then again September to November. Q: Is this a booking agent? A: NO!! You have found our website, we have a couple more out there too. Booking here is booking direct, book direct to save $$. Q: I am in a wheelchair or have special needs, can I jump? A: Most of the time we will be able to accommodate special needs tandem students, but every case will be assessed individually. Q: Do you have riggers on site? A: We have a full service loft, please call for details and pricing. Q: Are there packers on site? A: Yes there are, and they would be happy to pack your rig. A: We are located at the Glenwood Springs Municipal Airport in Glenwood Springs, Colorado. Click here for more information.